Seniors often have difficulty finding meaningful ways to spend their time during their retirement years. This may be especially true for those who had fulfilling careers or who spent time caring for a large family. To add more joy and interest to their lives, seniors may wish to find a healthy hobby to occupy their time. Here are six suggestions. Once a staple of retirement life, jigsaw puzzles are making a comeback. They require focus and concentration, which are healthy for the brain, but not too arduous. Seniors can start a puzzle and come back to it later, avoiding fatigue. Puzzles are also being manufactured now with larger piece sizes to help seniors with impaired vision or fine motor skill issues. If your loved one needs assistance with hobbies or daily activities, consider hiring a professional caregiver. Rhode Island respite care professionals can assist seniors with a wide array of daily tasks, offering family caregivers the chance to focus on other personal responsibilities or take a break to prevent burnout. Whether it’s for a few hours a day or a few days a week, respite care is the perfect solution for family caregivers who are feeling overwhelmed. For the social senior, book clubs offer the opportunity to engage with people who have similar interests and enjoy some books. Reading is a great way for seniors to promote cognitive health and stay in touch with the world around them. 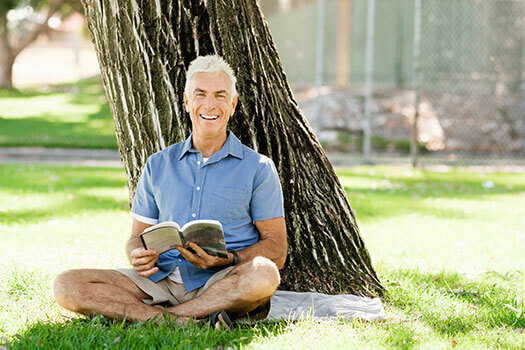 Many public libraries and senior centers offer book clubs that specifically cater to seniors. For those with a love of reading, book clubs are also good for exploring new material. As a practice, yoga is almost universally acknowledged as healthy for both the body and mind, and it is a low-impact activity that is ideal for many seniors. Yoga can be practiced at home or at a fitness center, so it can be a social activity as well as a physical one. Seniors can boost their overall health as well as their flexibility and range of motion with yoga. Performing yoga is just one of the many ways seniors can enjoy a high quality of life. If your elderly loved one needs help maintaining healthy habits, consider hiring a professional caregiver. Rhode Island families can rely on Home Care Assistance to provide dedicated and compassionate in-home caregivers who are trained in our holistic Balanced Care Method, which was designed to encourage seniors to exercise often, eat nutritious foods, maintain strong social ties, and focus on other lifestyle factors that promote longevity. As a younger generation gains interest in these hobbies, seniors can find many willing pupils if they already have knitting or crocheting skills. Classes are available for those who are new to these skills. Knitting is good for the memory and provides a sense of accomplishment when a project is completed, which can be great for seniors whose self-esteem needs a boost. For active seniors, walking can be an exceptionally healthy hobby that contributes to their overall wellness and reduces the risks associated with a sedentary lifestyle. Walking also allows them to spend time outdoors in good weather and appreciate nature and their local community. Seniors can take walks with friends or walk alone if their health allows. Language acquisition can be more difficult in the later years, but the cognitive benefits of doing so are worth the effort. For seniors who studied a second language in school, returning to that language may yield unexpected surprises. Seniors who want to pick up another language should look for classes or go online to find instruction or language learning apps. Books can also be a big help in getting started with this hobby. Engaging in hobbies is one of the many ways seniors can enjoy a higher quality of life. If your elderly loved one needs help maintaining a high quality of life while aging in place, reach out to Home Care Assistance, a trusted provider of Rhode Island home care. Services our caregivers provide include transportation to and from medical appointments and social events, nutritious meal preparation, assistance with daily exercise, and help with everyday tasks like bathing, grooming, and light housekeeping. If your loved one needs assistance managing daily activities, call us at (401) 284-0979 today.